Pegasus™ 2AA Red Training Model is a visible Red signaling beacon used during training operations in place of the Pegasus™ 2AA Infrared Beacon (NSN: 5855-01-618-0405). The Red Training Model can be seen with or without night vision. Pegasus 2AA Red Training Model is a programmable signaling beacon powered by 2 Common AA batteries. Constructed from high impact plastics, the Pegasus 2AA has been engineered to withstand harsh environments and chemical exposure. This tremendous strength coupled with a watertight design make the Pegasus 2AA superbly suited for water to land deployment and special operations applications. 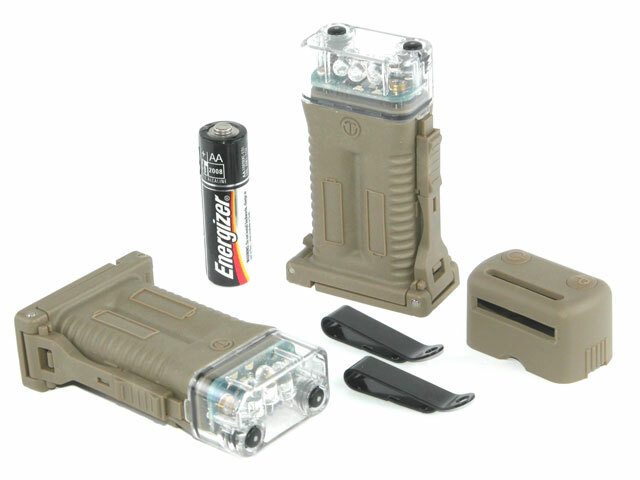 Powered by 2 common AA batteries, Pegasus 2AA uses the most common power source available anywhere in the world. All components including the battery cover are positively integrated and attached to the beacon so there is nothing to lose during operations. The Pegasus 2AA can be attached to PALS webbing, belts, or uniform by using the supplied locking spring clips Engineered as an enhancement to the Phoenix series of infrared beacons, the Pegasus 2AA incorporates the features most sought after by today's soldier's.